Part of our mission at Glencoe UMC is to constantly look outside the walls of our church to help those around us. To this end, we are very active in outreach and missions. In the past year we have two teams serving monthly at the Reidsville Soup Kitchen providing a hot meal to those in our area. We are there on the third Friday of each month. Our United Methodist Men and Women reach out to those in our community and beyond with a helping hand. Several men have gone on work/building teams and Disaster Response teams to Mississippi and Louisiana in the aftermath of Hurricane Katrina. 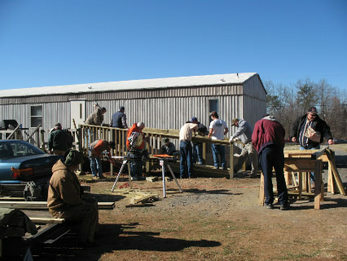 The United Methodist Men have also been busy building wheelchair ramps for disabled folks in our area. This is a vital need and one we are excited to be a part of. Our UMYF participates in an annual mission trip. We spend the week doing home repairs and coming to better understand God's call on our life to love our neighbor as ourselves by giving a hand-up to those in need. Our UMYF also provide a ham dinner on Christmas Eve at the Soup Kitchen and give out toys to the children. This is always a highlight of the holiday season. At Glencoe we are truly trying to follow the admonition to "Follow Jesus, Make Disciple, Transform the World." Since we are a church with a tremendous amount of young people, we do all we can to have fun events for the whole family. Throughout the year we have many special events designed to bring families closer together, and to help us get to know one another better. Our women meet monthly for United Methodist Women, and our men are active with United Methodist Men. At Glencoe UMC, we realize that the youth are our future, and we go to great lengths to design youth programs that are not only fun, but also teach our youth the ways of the Lord. We know that this is a tough world for kids to grow up in, and we want to do all we can to help prepare our kids for the challenges that face them. We have a tremendous number of youth leaders who strive to provide our youth with a safe, fun learning environment. Our Senior Youth Program is for youth in grades 9 through 12. Throughout the year the youth participate in a ton of fun events. We have been white water rafting, gone camping, been to the beach, gone bowling, attended many concerts, and gone tubing several times. There is always something fun going on with our youth group. Throughout the year the senior youth meet to learn more about God, the Bible, and how Christianity relates to our everyday lives. Our youth are also involved in several local service projects so they can learn the value of helping those who need a helping hand. Our Junior Youth Program is designed for kids in the 5th through 8th grade. Every month our junior youth group meets together to learn more about the ways of faith. 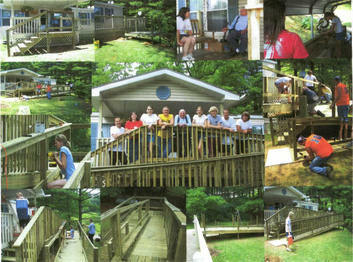 This group also participates in many fun activities, and often gets together with the Senior youth for games and fun. Our junior youth program seeks to keep kits interested in church at a time when many other things via for their attention. Our Confirmation Class helps prepare our kids for church membership. Over the course of 6 months, they learn all the basics of the faith, as well as participate in leading our worship services and giving back to the community through service projects. Our hope is through this class the kids will gain a respect for the church, and build a strong foundation on which to build their future lives. The class culminates with our young people professing their faith before the church and then joining our church if they so desire. We believe that offering meaningful programs for our children is one of the most important things we can do as a church. Each Sunday during our worship, we have a special time designed just for our children. During this time, the children come to the front of the church and hear a special message just for them. During our 11 a.m. worship, our children then proceed to children’s church where they participate in activities designed to teach them the basics of the faith while they are having fun. Throughout the year we have special programs for our children. We have an Easter egg hunt, Halloween and Christmas parties, a Christmas play, Vacation Bible School, and many other fun events. At Glencoe UMC, our children play a vital role.